Bees have been in the news a lot lately, and not for good reasons. Colony collapse disorder has been debated around the world, with fingers being pointed at many culprits. Not only does this crisis affect our overall food production, but it also hampers the production of one of nature's richest and most healing superfoods - bee pollen. 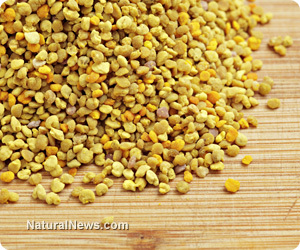 Bee pollen is considered one of nature's most complete foods. It contains nearly all the nutrients required by humans and about half of its 40% protein content is in the form of free amino acids and is highly bioavailable to the human body. Bee pollen helps correct diets that are nutrient deficient or imbalanced through its remarkable nutrient profile that is not only comprehensive but also very well balanced. It contains the richest known source of vitamins, minerals, amino acids, hormones, enzymes and fats, as well as significant quantities of natural antibiotics. In a nutrient-starved world, incorporating bee pollen with its exceptional vitamin, mineral, amino acid and enzyme profile could go a long way in filling in the gaps of your day to day nutrition. The overall effects of bee pollen are comprehensive, as it appears to activate systemic biological functions rather than focusing on one physiological area. After many years of testing, bee pollen has also been noted as lacking any harmful side effects, and it is easily digestible and suitable for all ages. Considering that all disease is partially rooted in nutrient deficiency, it is no wonder why this nutrient-dense superfood has such a positive effect on all the biological functions of the body. When deciding to incorporate bee pollen into your healthy lifestyle, there are a few factors you want to consider, including buying it raw (not pasteurized) and as local as possible. You also want to take care that you do not heat the bee pollen at higher temperatures (above 105°F), as it will destroy the delicate enzymes and vitamin C content. A great way to incorporate bee pollen into your diet is by simply eating the granules themselves, or incorporating them into smoothies, yogurt, trail mixes, cereal and oatmeal. Considering the positive effects that bee pollen can have on our diet, and the fact that they pollinate many of the world's crops, let's do our best to support the industry and feel better physically in the process.